Despite a relatively small country, Nepal has vast amounts of space as families and villages are often packed together in tight communities. With plenty of land, mountains and jungles take over the country with small pockets of populated ground. Just within my short, two-week trip, some of the scenery has been of unimaginable beauty. With 360° mountain views, it would be a dream of mine to wake up every morning to these beautiful sights. Outside of the capital, Kathmandu, the scenery is luscious green with running streams and waterfalls at every corner. Suspension bridges with motorbikes crossing or women baring goods from a basket suspended by a strap around their heads are just a few of the thousands of incredible sights in Nepal. You’ll be so surprised how far your money can take you in Nepal. A large bottle of national beer will set you back just £2 in a vendors shop whereas a cocktail marketed at tourists will cost around £3.50. You can easily get a three-course meal with alcoholic beverages for two for under £35. I’d suggest taking a look on Trip Advisor for a great restaurant however almost all of the restaurants are rated as 5*s just simply because the food is incredible! 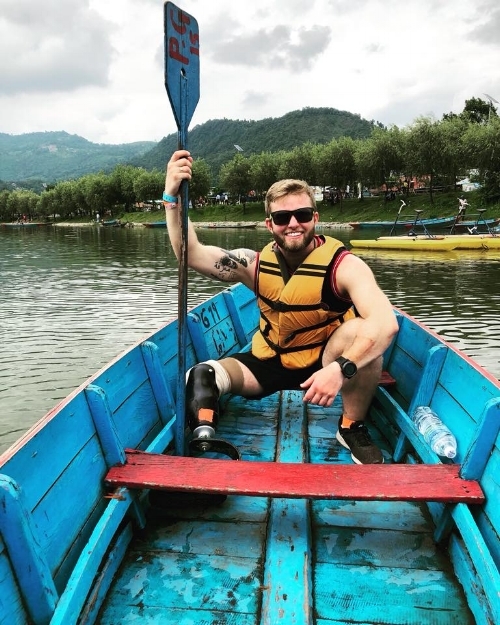 Excursions are extremely cheap and travel between larger areas (Kathmandu -> Pokhara, a 10 hour drive) can cost anything between £5-20 depending on your desired comfort level. 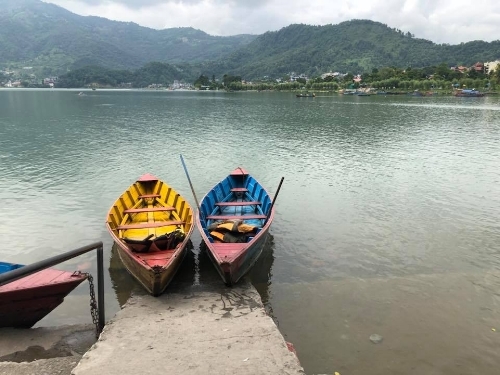 To travel between Pokhara and Chitwan National Park, we decided to take a bus for about 4 hours and then have a white water rafting experience for a few hours. I believe the cost for this was just £32 for two of us! I found that the Nepalese culture, generally speaking, was relatively healthy. With many physically fit individuals, I expected the food portions to be smaller however they simply weren’t. In your trip, expect huge portions of rice and enough food to feed you for days. For the best value for money, avoid western foods but expect your starters to be the expected size of a main dish in the UK. 4 – Where were the English Tourists? I keep referring to Nepal as a hidden gem in the UK just simply because we only met two other British tourists in our whole trip. With the over-population of more Eastern-Asia, such as Thailand, Vietnam, Cambodia, Nepal is less well discovered and that was clear from the reactions of the Nepali people when we told them of our British heritage. As a lot of us in the UK, I try my best to cut down on my environmental impact through reducing wastage, water and electricity usage etc and I am often shocked when people are not able to see the consequences of their actions. It is clear that Nepal, as a nation, is aware of their environmental impact however the problem is much larger than I would have imagined. Landing in Kathmandu, I was shocked at the pollution levels and even as the plane descended, I saw a pollution fog surrounding the main city. Escaping from the most hectic airport imaginable, we were surrounded by individuals wearing masks to protect them from the pollution. I felt as though my lungs could not expand properly and even after a few days, I felt as though my skin, hair and health were deteriorating. Taxi drivers were throwing their waste out of their windows and rivers were flooded with waste. After speaking to Nepalese people outside of Kathmandu, it was clear that a lot of them were avoiding the city just for the pollution alone. Surprisingly though, Kathmandu did not actually smell! After a very smelly experience in Bangkok, I would have expected a terrible odour however that was simply not the case. There are no words that can accurately describe the traffic and road conditions both in and out of the city. With motorbikes and cars overtaking at every possible moment, lane control goes out of the window! As a pedestrian without paths, you become accustom to having every form of transport overtake you with very small gaps. At first it is very overwhelming however I am now thinking that it is very strange to go back to the lovely and calm roads of the South East of England. It is common practice for (literally) holy cows to be sitting in the middle of the road. Very few cars have suspension and potholes fill the roads. To be able to cross the road as a pedestrian, you simply have to find a gap and walk across – the traffic will (hopefully) spot you and move out of your way. My experience in Nepal was to learn that whatever the weather forecast says, you just have to completely ignore it. Rain will pour down when it fancies and the sun will beam without warning. I expected the weather similar to be similar to the rainy season in Thailand. The sun would shine and then minutes later, the heavens would open for a few minutes before beaming sunshine – that wasn’t quite the situation. We had no rain whatsoever for the first week and then two days of solid rain before the sun decided to show his face again. Essentially you just need to be packed and prepared for everything and completely ignore the weather forecast. With a visit to the capital city, one would expect copious amounts of tourists taking pictures and visiting the sights of beauty. Having said that, we did not encounter many tourists at all. Although we visited in the rainy (off) season, we would have expected more people to be visiting the beauty of Nepal. As tourists in a low season, we were treated extremely well by the hotel staff and really felt as though our stay was welcome. With close/neighbouring countries of India and China, the majority of tourism came from local countries or from within Nepal itself. We can all imagine the streets of Morocco – vendors selling their goods, full of colour and full of ridiculous prices. To purchase an item, you are often expected to offer 1/3rd of what they are offering and then find a compromise, often about half of the original stated price. In Thailand and even London markets, this is expected practice whereas Nepal is very different. With the exception of Taxis, vendors will often not reduce their prices whatsoever and lots of owners promote their ‘fixed prices.’ This actually allows for a really great shopping experience if you simply have an item in mind as you don’t have to faff about trying to argue for a price which you know the item is worth. Having said that, still take a good look at the price they’re offering and try and get yourself a good bargain. 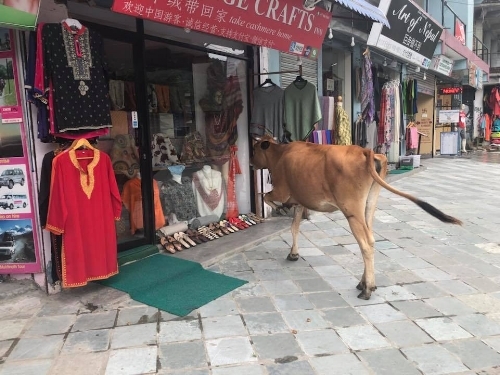 I’m a great lover of holiday shopping and Nepal was certainly the right place for my shopping. With camping and hiking equipment available on every street, you’ll never be short to find yourself a ‘North Fake’ bargain. To give you an idea of prices, I bought a North Face,Gore-Tex jacket, two pairs of trousers (Arteryx and North Face) and two walking poles for under £30! Nepal is certainly a fantastic place to visit whatever the season. With great value for money and breath-taking views, I will certainly be visiting again.